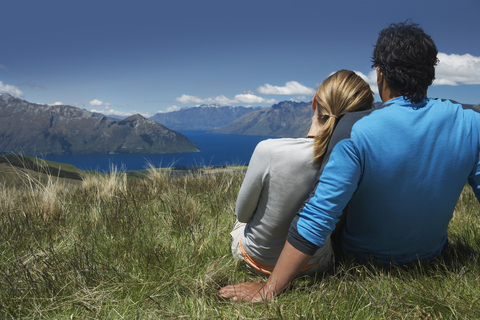 New Zealand, like Australia, has a pretty active online dating scene. 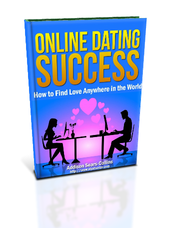 The best online dating sites in New Zealand will have plenty of opportunities for you if you are looking for love. New Zealand is similar to Australia as well in that it doesn’t have the racial mixture that you will find dating online in the United States or in Canada. When you go to cities like Auckland, Wellington, or Christchurch, don’t expect to see people of different skin colors, body shapes, and sizes like you would find in a country such as Brazil. Nevertheless, with enough work on your part, you might be able to find some hidden gems. I believe beauty is present in just about every culture (some more than others). Should you decide to sign up for the online dating sites I recommend below, be sure to read member profiles carefully as you might come across a lot of fake profiles. Usually, I can spot these profiles easily. A woman who has only one picture posted, is wearing a tight swimsuit and making an overly suggestive pose are usually clear signals to steer clear. Also, in order to avoid the boredom factor, I advise you to send messages to those people that have well-written, interesting profiles. In my experience…the more boring the profile, the more boring the person. Here is the quick list of the top two dating sites in New Zealand. I’ll go into more detail in my reviews below. FindSomeone has been around since 2002, with over 400,000+ members. This number may not seem like much, but this is actually around 10% of New Zealand’s population. FindSomeone is owned by Fairfax Media, which also owns the popular websites TradeMe and Stuff News. FindSomeone benefits from being owned by such a well-established media company. Its security is top-notch, and the website overall has a clean, appealing design. The only thing holding FindSomeone back is that it is exclusively for residents of New Zealand. However, if you find yourself traveling there in the near future, definitely give this site a try. Sign up via your Facebook account, or enter your email address and a username and password. Next, enter your name, birthday, marital status, location, and gender-seeking-gender. After that, upload your photos, and activate your account with a code received by email. Log in, and you are free to roam! Filling out your profile consists of a basic “About Me” section, a “Lifestyle” section with different prompts (Sports and Exercise, Food, Hobbies, etc. ), and a “Thoughts” section with more prompts (children, commitment, drugs, politics, etc.). Peruse the home page, which shows members’ recent activity. Search by gender, age, location, lifestyle, background, appearance, and keyword. Browse by latest users to join (today, week, month), users with photos, users online right now, or by region in New Zealand. Look through your “matches”, profiles that both fit your ideal partner criteria and are looking for members with your information. Favorite other members, send them a message (text only), or send them a free “hug”, “kiss”, or “smile”. As a premium member, you can also send a “rose”. Exciting stuff, I know! Another form of communication is the “message board”, a forum where members can chat with another on various topics, organized by Lifestyle, Opinion, Relationships, and Site Suggestions. There are also Men-only and Women-only sections, which felt like a nice touch. Finally, there is a tab dedicated solely to events organized by and for members of FindSomeone. Free members can view and attend events, but a Gold membership is required to create your own, or comment on existing events. Free – Sign up, browse/search profiles, send smiles, hugs and kisses. Gold – See your matches and their photos, send messages to anyone, upgraded privacy options, and see who has viewed your profile or favorited you, organize or attend events. Message Pack – Open conversations with 3 people. 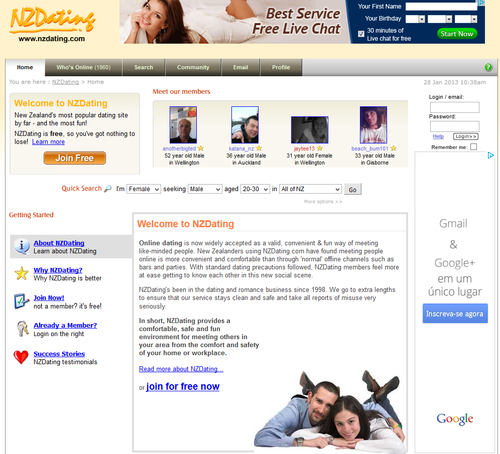 NZDating.com is a decent second choice for an online dating site. NZDating has been around since 1998, and it doesn’t look like their website has been updated since then. Bland design, dated-looking emoticons, lots of ads…it’s not an ugly website, but it sure isn’t beautiful either. All that said, NZDating does have over 100,000 members and sports enough features to make it worth a try. 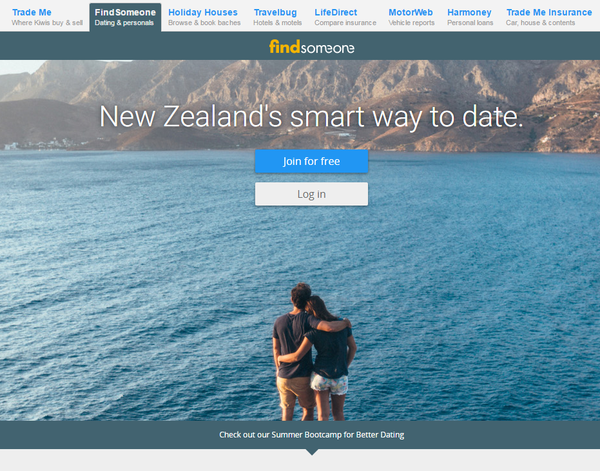 Although not as big or as pretty as its main competitor in New Zealand, FindSomeone, NZDating does have one leg-up on the competition: it allows overseas members. You’ll be tagged with an “Overseas Member” badge, but at least you can sign up and get your foot in the door. Filling out the rest of your profile includes more personal information: drop-down boxes, a profile “caption” and larger text boxes to describe yourself and your ideal partner. Gold members can add emoticons to these boxes, as well as spell-check what they write. You can also upload photos, and “adult” photos if you have “Seeking sexual meetings” as your ad category. Quick Search – Search by gender, location, age and sexual preference. You can also choose between pre-set quick searches: new friends/adult relationships in my area, perfect matches, online members in my area and members in my area with the same number of children as me. Full Search – Further filter searches by desired relationship-type, star sign, and any of the drop-down boxes specified in your own profile (religion, ethnicity, education, etc.). Who’s Online – Can be filtered by gender and location (but not age for some reason). You can also select to include free members, exclude sexual categories, and show faces only. 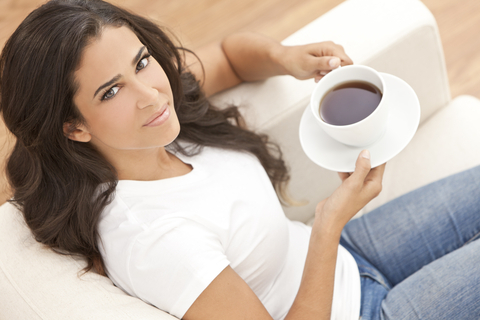 Perfect Match – Select your preferred match criteria and rate the importance of each one. NZDating will then find matches for you and let you know your percentage match with each member. Standard members using this feature can only see matches of Gold members. You can send Smiles and messages (text only), add profiles to your contacts list and, if you’re a Gold member, add profiles to your “Buddy” list. This is basically an enhanced contacts list where those invited can join your chat rooms without invitation and view your private photos. NZDating will mark your profile with different badges depending on your situation. Overseas members get an aptly named “Overseas Member” badge, members who sign up with free email addresses (Hotmail, Gmail, etc.) get a “Standard Member” badge, and those who sign up with paid email addresses get a “Silver Member” badge. NZDating does this in an attempt to warn members that Overseas and Standard members may be less trustworthy.